GRUP DE RECERCA EN GEOMETRIA COMPUTACIONAL I MATEMÀTICA DISCRETA. 2014SGR46. Tecnicas de optimizacion en teoria de grafos, grupos y combinatoria. aplicaciones a redes, algoritmos y protocolos de comunicacion. The (¿,D)(¿,D) (degree/diameter) problem consists of finding the largest possible number of vertices nn among all the graphs with maximum degree ¿¿ and diameter DD. 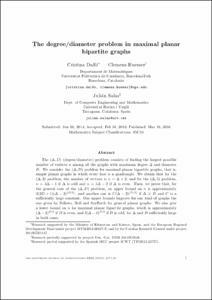 We consider the (¿,D)(¿,D) problem for maximal planar bipartite graphs, that is, simple planar graphs in which every face is a quadrangle. We obtain that for the (¿,2)(¿,2) problem, the number of vertices is n=¿+2n=¿+2; and for the (¿,3)(¿,3) problem, n=3¿-1n=3¿-1 if ¿¿ is odd and n=3¿-2n=3¿-2 if ¿¿ is even. Then, we prove that, for the general case of the (¿,D)(¿,D) problem, an upper bound on nn is approximately 3(2D+1)(¿-2)¿D/2¿3(2D+1)(¿-2)¿D/2¿, and another one is C(¿-2)¿D/2¿C(¿-2)¿D/2¿ if ¿=D¿=D and CC is a sufficiently large constant. Our upper bounds improve for our kind of graphs the one given by Fellows, Hell and Seyffarth for general planar graphs. We also give a lower bound on nn for maximal planar bipartite graphs, which is approximately (¿-2)k(¿-2)k if D=2kD=2k, and 3(¿-3)k3(¿-3)k if D=2k+1D=2k+1, for ¿¿ and DD sufficiently large in both cases. The (Δ,D)(Δ,D) (degree/diameter) problem consists of finding the largest possible number of vertices nn among all the graphs with maximum degree ΔΔ and diameter DD. We consider the (Δ,D)(Δ,D) problem for maximal planar bipartite graphs, that is, simple planar graphs in which every face is a quadrangle. We obtain that for the (Δ,2)(Δ,2) problem, the number of vertices is n=Δ+2n=Δ+2; and for the (Δ,3)(Δ,3) problem, n=3Δ−1n=3Δ−1 if ΔΔ is odd and n=3Δ−2n=3Δ−2 if ΔΔ is even. Then, we prove that, for the general case of the (Δ,D)(Δ,D) problem, an upper bound on nn is approximately 3(2D+1)(Δ−2)⌊D/2⌋3(2D+1)(Δ−2)⌊D/2⌋, and another one is C(Δ−2)⌊D/2⌋C(Δ−2)⌊D/2⌋ if Δ≥DΔ≥D and CC is a sufficiently large constant. Our upper bounds improve for our kind of graphs the one given by Fellows, Hell and Seyffarth for general planar graphs. We also give a lower bound on nn for maximal planar bipartite graphs, which is approximately (Δ−2)k(Δ−2)k if D=2kD=2k, and 3(Δ−3)k3(Δ−3)k if D=2k+1D=2k+1, for ΔΔ and DD sufficiently large in both cases. Dalfo, C., Huemer, C., Salas, J. The degree/diameter problem in maximal planar bipartite graphs. "Electronic journal of combinatorics", 2016, vol. 23, núm. 1, p. 1-23.